The Trump administration’s new argument: Collusion is cool. That’s the message the Trump administration has been sending since news broke of Jared Kushner’s contacts with the Russians. 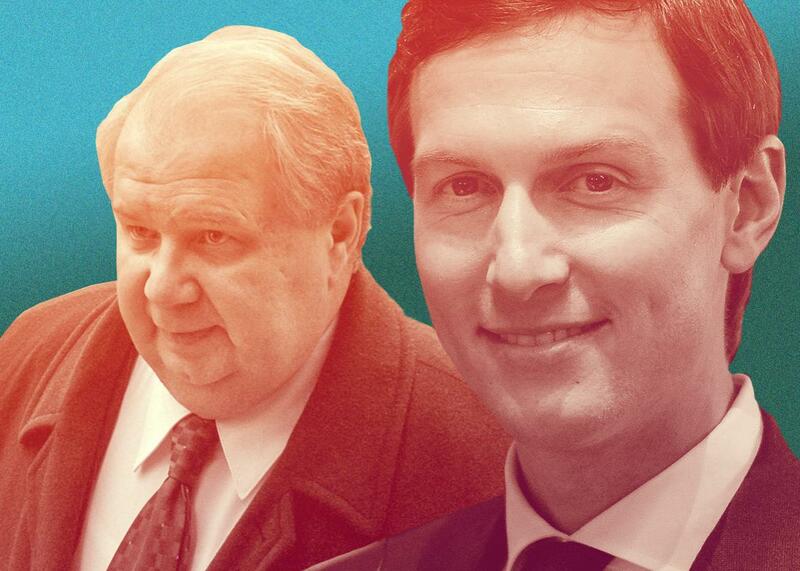 White House senior adviser Jared Kushner and Russian Deputy Foreign Minister Sergey Kislyak. Photo illustration by Slate. Photos by Olivier Douliery-Pool/Getty Imagess and Stan Honda/AFP/Getty Images. Throughout the investigation of Russia’s role in the 2016 election, President Trump and his allies have insisted that he’s innocent of the most serious charge: collusion. Every time a new link or contact is discovered—Russian payments to a Trump adviser, Russian recruitment of a Trump adviser, Russians boasting blackmail leverage over Trump—the White House repeats that there’s “no evidence of collusion.” But lately, some of these contacts have begun to look conspiratorial. So Trump and his surrogates have come up with a new line of argument: Collusion is OK.
Two previous episodes have drawn the administration into defending collusion. The first was Michael Flynn’s Dec. 29 phone call with Russian Ambassador Sergey Kislyak. The second was a May 10 visit to the White House by Russian Foreign Minister Sergey Lavrov. Both episodes involved secret exchanges. But last week, a third story made the pattern inescapable. On Friday, the Washington Post reported that in early December, Kislyak, Flynn, and Trump’s senior adviser and son-in-law, Jared Kushner, “discussed the possibility of setting up a secret and secure communications channel between Trump’s transition team and the Kremlin, using Russian diplomatic facilities in an apparent move to shield their pre-inauguration discussions from monitoring.” According to intercepted Russian communications, the idea of using Russian facilities came from Kushner. This meeting, undisclosed at the time, led to other secret encounters: one between Kushner and a Russian banker; another between Kushner, Flynn, and an Arab intermediary for Russia; and a third between emissaries for Trump and Russia on an island in the Indian Ocean. The Kushner revelations, coming on the heels of the Flynn and Lavrov episodes, have established a pattern of clandestine cooperation between Russia and the Trump regime. To defend this pattern, Trump’s surrogates have sought to justify what they once renounced: collusion. Here’s what they’ve said since the Kushner story broke. 1. Back-channel talks are normal. “Back channels like this are the regular course of business,” Trump’s counselor, Kellyanne Conway, said on Fox and Friends earlier this week. That’s misleading: Back channels are common in government but not in presidential transitions. Furthermore, the whole point of a back channel is to bypass the regular course of business. But Conway’s argument isn’t about logic. It’s about numbing viewers to Trump’s deceptions. 2. Talking is healthy. “To open channels of communication with any country—back-channel, up-front—is a good thing,” said John Kelly, Trump’s secretary of Homeland Security, on This Week. It’s about understanding one another. Who could be against that? 3. Talking doesn’t commit us to anything. It doesn’t “predispose” us to any course of action, said H.R. McMaster, Trump’s national security adviser, in a press briefing on Saturday. It’s just talk. So it can’t be legitimately construed as a conspiracy. 4. You can trust Trump’s people to do things ethically. Conway said Kushner has the highest certificate of integrity: Trump’s “full confidence.” Kelly, speaking on Meet the Press, vouched for Kushner as well: “I know Jared. He’s a great guy, decent guy. His No. 1 interest, really, is the nation.” But when Chuck Todd asked what level of security clearance Kushner had, Kelly couldn’t answer. In the Trump administration, nobody needs to know about anybody else’s talks with the Russians because everybody’s a great guy. 5. If anything important happens, they’ll tell us. “Just because you have a back channel, if indeed that’s what Jared was after, doesn’t mean that he then keeps everything secret,” said Kelly. “He shares that” information, Kelly assured Todd. On This Week, Kelly added: “Whatever the communication is, it comes back into the government and [is] shared across the government.” Kelly seemed quite confident about this despite apparently having no idea, as the secretary of homeland security, what Kushner had discussed or learned. 6. Private diplomacy is harmless. On Fox News Sunday, Chris Wallace pointed out that Kushner’s talks in the final months of the Obama administration were at odds with, not on behalf of, the U.S. government. “We have one president at a time,” he noted. But Kelly said Kushner’s moves were still OK since Trump’s team was “not in a position to do anything to inhibit the Obama administration.” This line of argument justifies covert contacts either way. If you’re in power, your collusion is presumptively legitimate. If you’re out of power, your collusion is presumptively harmless. 7. The real threat is nosy Americans. Todd reminded Kelly that Kushner had proposed to use the surveillance-proof facilities of the country that, according to “our own intelligence community,” had just interfered in our election. Kelly replied that this move made sense, “politics being what they are … here in Washington.” It wasn’t clear whether Kelly meant Congress, the press, or hostile U.S. intelligence officials. Either way, he was justifying the use of espionage to evade American scrutiny. 8. The worst regimes are the most worthy of secrecy. On This Week, Kelly suggested that Russia’s aggression and its election interference made quiet talks all the more vital. “Any way that you can communicate with people, particularly organizations that are maybe not particularly friendly to us, is a good thing,” he argued. Kelly stuck to this talking point even when Martha Raddatz noted that Kushner’s way of communicating reportedly involved Russian facilities. On this view, the more treasonous the collaboration looks, the more legitimate it is. What’s most significant about these arguments is that they don’t just excuse the Trump team’s post-election meetings, emails, and phone calls with Russians. They can also be used to justify conversations that are discovered to have happened before the election. The 18 contacts reported by Reuters two weeks ago—previously unknown phone calls and emails between Trump advisers and Russian interlocutors, all of which took place in the final seven months of the 2016 campaign—might be just the beginning. The more we discover about these conversations, the more we’ll hear from Trump and his apologists about the importance of “communication” with Russia. Or as we used to call it, collusion.